Corinthia’s five-star London property is now taking reservations for stays from the start of April. The hotel is located on Whitehall Place close to Trafalgar Square and St James’s Park. The 294-room Corinthia Hotel London will be the first property for the group in the capital, and will be housed within a Victorian building dating back to the late 19th century and formerly housing the Metropole Hotel. Features will include a restored Victorian ballroom and adjacent Court Room, 470sqm Royal Suite, and seven duplex suites within the building’s turrets with views of the River Thames and Trafalgar Square. The Northall restaurant will serve “the best of British artisanal produce”, while Bassoon bar will offer “molecular cocktails and colonial inspired drinks from its boutique spirits library”, and Massimo Restaurant and Oyster Bar will focus on daily catches. The ESPA Life at Corinthia spa facility will be spread over 3,300sqm, with four floors including treatment rooms, an indoor pool and a fitness centre. 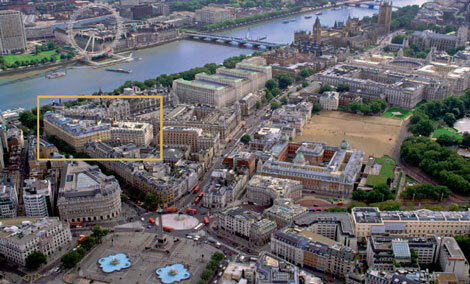 The Corinthia Hotel London is one of several luxury properties to open in the capital over the next few months. Four Seasons London at Park Lane is due to reopen on January 31 following an extensive refurbishment programme, while W London will open on Leicester Square on February 14, and the St Pancras Renaissance Hotel London is now taking reservations from March 14. For more information visit corinthia.com.